Before the disasters of 2017 *Anna was the working mother of a newborn baby boy who had her own apartment in Huntums Ghut. But, after hurricanes Irma and Maria, she became jobless and homeless and for the last several months, she has been living in shelters and raising her son among strangers. Anna first moved into the Multi-Purpose Sports Complex in October but recently relocated with others to the Long Trench Community Shelter on Tortola. The mother of the now one-year-old infant is trying to get back on her feet but it has been an uphill battle, she told BVI News yesterday, May 31. “It’s rough,” the British Virgin Islands native said, referring to her securing full-time employment and keeping herself and her son fed. She recently made headway by landing a part-time cleaning job in the afternoons while a friend babysits her infant. Coupled with her employment woes, Anna said residing with at least 15 other residents at the shelter — which is currently without a manager — can be challenging. 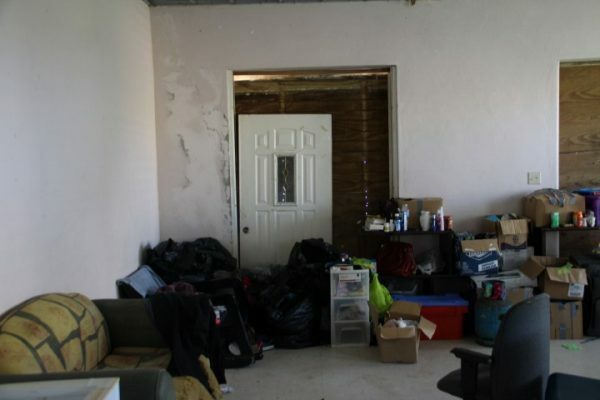 She said persons are expected to fend for themselves inside the partly unkempt facility furnished with a scruffy sofa, an empty freezer, and piles of heavy duty garbage bags and boxes filled with shelter residents’ personal belongings. “Living with other people is rough. You have some rude and disrespectful ones … I don’t like it,” said Anna, who now longs to move on from this eight-months-long chapter of her life. “I have no plans. I don’t know what I am going to do. It’s stressful,” she told BVI News. In the meantime, the 2018 Atlantic Hurricane Season officially begins today, June 1. And government is yet to fully repair or announce the official emergency shelters that will be used in the event of a disaster. Doors at the Long Trench facility are still secured with plywood while the windows and the roof appear to need minor repairs. 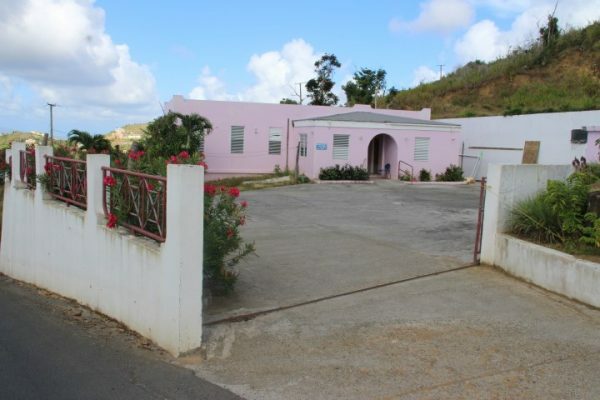 According to authorities, shelters such as the Long Trench Community Centre will be repaired in time for the ‘peak’ of the season. The use of * signifies name changes at the request of the source. Sections of the Long Trench Community Centre. The Long Trench Community Centre. Doesn’t she have family?…that is np.place to raise he son …Im sure she have family….Families have to band together and look out for there own …rhus is not good…if I had space I would have taken her in …its not a good environment …the child can get sick..
so way the child father to be helping out, some fathers just settle for sh-t my child/children ain’t suffering. not as long as I am ALIVE. I feel for Anna and her baby ???????? i pray that a job and an apartment be made available sooner than later. Blame your Government officials for making everything black vs white, expat vs local! If we had encouraged proper investment into the Territory we wouldn’t be facing these problems. Remember for years everyone said let the expats leave, we will be fine? Thousands have left, are we fine? We haven’t seen the last of the effects of Irma, better brace yourselves. the comments above by “sad” and “so sad” are just disgusting. We declare and decree that the BVI is STRONG and BV Islanders are even stronger. We shall not fall or crumble as many of you want to see. We WILL grow, rebuild and “continue” to be the gem of the Caribbean where so many of your kind want to visit and would not go home. We love you all and Ms. Anna will be just fine thank you. I would like to know where you got your figures of companies laid off locals and not persons from the territory. We advertised for 3 months asking only for persons that did not require a work permit to apply. We received not one application, not one. because some of ayo locals wasn’t doing no work.. Blame Government. Possibly why she is in the situation currently and in the future along with her child (ren). You and others have instilled a dependency and blame others mentality in some of the youths much to their detriment. Each one of us in life here on earth determines our own destiny. What nonsense are you posting. Government cannot be responsible for taking care of healthy strong people fulltime. What about the child’s father. There is no mention of him in the article because it seem to have been written with a motive. Also, it would be good if we could live well with our other family members and even our neighbours, so that when we are desperately in need they would be willing to assist. Everyone has someone, and we need to look out for each other and stop expecting so much from Government. The article mentioned an empty freezer! Who is responsible for ensuring that it is full? I was wondering what the freezer was even mentioned, as if she lives ALONE. I am fine Just widh some more ,lots more of them will leave. Bet you then she’ll get and bring another baby….That is the problem with trying to help people. As far as I’m aware, the Ministry of Health has programs in place to address these sorts of issues? Did this individual reach out to Social Services or any other Government department to seek help? Family Support Network? Did they reach out to her? She needs to reach out to them. She is the one complaining about hardship. They suppose to reach out to her? No initiative,no a——-,just waiting on Gov? People with this type of mentality should not have children. They have ————- to give them and ————- to teach them. it better off if the government share the 3/4 million equally amounts everyone living in the BVI. Very sad beginning for the baby. No grandparents or other relatives including his father? Don’t need grandparents,relatives or tge baby daddy when Government is there to wipe your mess. A sad beginning always ends well.its motivate and drives you to do well. Hope you understand my point. I know this young lady very well and she needs to tell the truth to why she still lives in the shelter. She was employed and had a home before the hurricane. But the question is why her employer did not take her back. Why her family not around. You can not walk around being rude and disrespectful and can’t fend for yourself when you have to. This y—- —- is the same one that r—- to stay with family stating that government have to take care of — and — —. That type of mentality will make a person remain in a shelter for a very long time. I have known person’s that have reached out to — to offer — a job, but — is choosing and refusing. So we need to stop blaming the government and blame the i——-. Some of us could read through the story lines, but we refuse to. Interestingly, the story did not say that the baby daddy is dead or disabled, but …the shelter, this and the shelter that… At least there is a shelter with a roof over her and the baby’s head. There are lots of US Army veterans sleeping under bridges and in card board boxes whether rain or snow falls or sun shines. He who has nothing must be grateful for little. Thank you @two sides to a story. Despite the sad situation and her needing trying to find her way, clarity was needed. I love people and love helping so I went around to the shelter that remained opened in the end like the one Anna was in to find out if if one needed anything etc. Anna and baby was there all the times i visited. Upon initial visit, introduced chat for a bit. She was born in BVI but lived in Antigua and few yrs prior moved back to BVI. So I was guessing the rest of her family lives there besides the few you mentioned that are here. But I must say she was well kept along with bay and her living area was well stocked and she never wanted for anything from my view. She was taken care of. I guess she just needed some where to live. But as I continued around to the other occupants, a story similar came. So I guess those words were uttered else where. I was really shocked and thinking, there are really homeless people out there and this is the mentality here after such as disaster when the country is so crippled. But despite that I still went to the groceries and while getting stuff for the others even though she said she was okay, I still grabbed stuff for her and the baby. I almost uttered when I returned with the items “cant you go to Antigua by your family since the BVI is so crippled at the moment and once they are up you return?” But I paused and left that alone. Thanks for bringing clarity to the situation because I myself saw her when she was at the shelter in town, and felt sorry and wanted to help but I kept wondering the same things, and if it would be wise to get myself into a situation i would regret later on. Rude people I cannot tolerate, so maybe it was best that I held back for a bit. The “—“s are there because BVINews erase certain information that they consider sensitive, like names and certain actions. Whatever the person typed, it was more likely in full. Cant we all as a community get together. Find her an apartment? Pay the rent for her and supply her with food for the next 6 months. Yes we can. I will put up the first $50 each months. Need some feed back. Not because I aint from here.Dont matter. She’s a sister in need. I agree.Only who in the fire does feel the heat.I will pledge the second fifty, come on people lets do this thing. I have one advice for this young Lady what ever you do don’t get any more children, don’t get me wrong now,I love children just take my advice. Where is the father of the baby in all of this? How can any person who calls himself a man sleep at night and carry on with his life knowing the conditions his seed is growing up in? Knowing that his child doesn’t have a place to call home. Why isn’t that father being pressured to take the child out of that totally undesirable situation? Right. Instead of going to the media, she needs to find herself up by the Magistrate Court and start there or see if she is able to get some legal aid to deal with the father’s behind. She will certainly get some assistance there. so she has a newborn……where is the daddy? Some men make me sick with shame…..he should be ashamed of himself……. She’s a human being. does it matter if she born here or not? These comments. Where is your compassion? BVI not helping BVI. People get ready! You could have your shelters full in a few months time- but keep marching around for P——– and ignoring the very real dangers just around the corner. Keep blaming expats and locals for stupid things only a few individuals have done. Keep being racist and shortsighted. The root of so many BVI problems is being selfish. As the storms have shown, it isn’t simply good enough to have food and shelter for yourself, you need a community for a quality of life. Are you really a community that let’s a woman and her infant child live in a shelter because of a storm? Apparently so BVI. It doesn’t matter why she is there. INFANT CHILD. SMH you should all be ashamed. The operative word here is shelter. She has been given free shelter,free food. So what now we must do is use her free toilet paper to clean her i————— tush. Women like her and there are too many, perpetuate the belief that black women are mat——- and welfare mongers. Expat or child of such. Enough of them here to take care of each other but instead they focus on making the BVI another pile of human refuse. This is exactly why young ladies need to take precautions to prevent pregnancy until they are ready financially emotionally and mentally to have children. Wait until you are married to have a child. For God sakes you need to earn more than minimum wage to care for yourself let alone a child!!! You cannot depend on others, even the father or family to care for your child. If you have no way to provide the basic necessities in life for yourself or your child then you have no business having a baby. If you do get pregnant then you need to consider adoption and give the child a chance for a proper upbringing with responsible parents. In my opinion government should be stepping in for the purposes of that 1 year old. That child needs to be placed in a foster home until the mother can find gainful employment and find shelter for herself and the child. Her family and the baby father could step in to give her some help. This is a family problem and someone needs to look out for their daughter or baby mother. As for community,she needs education or skills at something where she can get a job and provide for her child. Maybe someone could step in and provide apprenticeship in cooking or hairdressing etc. Of course she is the most important person when it comes to getting herself out of the predicament she finds herself in. She has to be willing to make the effort and the sacrifices for change. Everybody have them ways, God forgive us so we can forgive others. NDP need cancel festival and help people with that money.